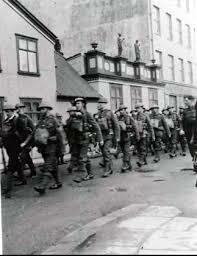 The Brits came in the night, landed at Reykjavik with no fuss, no bayonets, no shots fired. 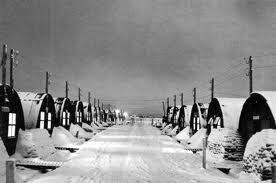 They arrived to occupy Iceland because the Nazis had been sending delegations, were showing great interest in Iceland. Their interest was understandable since Iceland was like a great aircraft carrier in the North Sea. It provided a critical link in the supply route from North America to England. Iceland has never had an army, navy or air force, no experience of warfare and, for centuries were forbidden to carry weapons, so the arrival of the British army occasioned a great deal of curiosity. Efforts were made on both sides to make the occupation as conflict free as possible. There were restrictions on when armed forces personnel could leave their base, on their behavior when off the base. The problem, however, was that first the Brits and then the Americans arrived in large numbers for such a small country. The soldiers were young, male, had some money to spend, were different. It was inevitable that there would be clashes between young Icelandic men and the soldiers. It was equally inevitable that many of the Icelanders would resent the occupation and the disruption of their lives. Daisy Neijmann gave a talk at the University of Victoria (sponsored by the Richard and Margaret Beck Trust) during the Learneds on the way that British and American soldiers have been portrayed in Icelandic fiction. She pointed out that the soldiers were seen by some as engaged in trangressive behaviour exploiting women and children. The victims of this behaviour were women and children. The occupation was described as a fairy tale, a fantasy realm where monsters violated social order. It’s not surprising that some writers saw the soldiers as monsters. They were not “us” but “other”. They had uniforms, their behaviours were strange, they carried weapons, they spoke a language few Icelanders spoke and they didn’t speak Icelandic. With Iceland just emerging from a Middle Aged society, there was no previous experience of how to behave toward an occupying force. Because the soldiers came in such large numbers, they were seen not as individuals but as indistinguishable from one another with references to them not with names but as the soldier, the major, with dark skins, moustaches, sharp facial features. They seemed to have no individuality. Given the number of soldiers, the uniforms, the military behavior, it is not surprising that they were seen that way. The general attitude toward the soldiers was summed up by the Prime Ministers telling the people to avoid the soldiers as much as possible but to be polite. Daisy gave examples from numerous books. In some of them the soldiers are seen as made of steel. In another, the lack of individuality of the soldiers is compared to the individuality of the Icelanders and the military ability of the soldiers is mocked. Some of the books, Daisy mentioned were “Lover’s Gifts” (1955), “Jon the Cobbler”(1940), “Dancing by Daylight(1947), “North of War”(1971). Through everything there is sexual tension. How real it was can be ascertained by the fact that women found consorting with soldiers were forcibly removed to the countryside away from temptation. In “Her”(1968), there is this little dialogue. Those few lines capture the attitude about the soldiers. Oversexed, predatory, interested in nothing but seducing Icelandic women. What surprised me was not the attitude toward the soldiers. I‘d seen the same thing toward all the single airmen at the Gimli airbase. There was many a fist fight over some local girl. The local boys didn‘t like the competition by guys in snazzy uniforms who represented exotic places far away. What did surprise me is that the writers repeatedly express contempt for women. And, more difficult yet, that the few women who wrote stories that included soldiers were just as contemptuous of women. It is as if women were the enemy. However, in 1955, in a novel by Svava Dún, the main character says ‚ ”It had never been as fun to live in Reykjavik as these past days.“ The arrival of the soldiers is seen as very positive and life as better. Daisy finished by saying that Indridason in one of his recent novels portrays an American soldier in a very positive light. The soldier is kind, empathetic, and protects a brutally abused Icelandic wife from a dreadful, violent Icelandic husband. This is a reversal of the way that the soldiers have been portrayed in the past. Not many people of Icelandic descent in North America know much about the early occupation of Iceland by the British and then the Americans. It was interesting to hear how that era was experienced and reported by Icelandic authors. This entry was posted in Uncategorized and tagged american occupation, british occupation, Daisy Neijmann, Dancing by Daylight, Iceland, Icelandic fiction, Icelandic novels, Indridason, Jón skósmiður, Noah of War, Sigurður B. Gröndal, Svava Dún, The Guardian Angels, Theodór Friðriksson, Toni frændi, WWII by william. Bookmark the permalink. Came across this blog while looking for info about my mother, she was born in Iceland and worked on the family’s farm. She married my father a British soldier in 1942 while he was stationed there, she came to England during the war traveling on a merchant ship landing in Scotland. She could not speak or understand a word of English when she came here. I can not imagine how she managed. My mothers life was one of hardship and personal suffering, but up until her death in 2007 she was always laughing despite everything.